This 100% lead-free brushed nickel drain is soft touch activated, also known as a "click clack" drain, simply press the button shaped top down and the vessel sink drain will open or close. This pop up sink drain owns an overflow. Push Pop Cap Dimension: 1-1/2"
Please check the image of the drain's detailed dimensions to make sure the stopper fits for your basin or sink. To avoid leakage, clean up the top and bottom sides of the sink and remove old silicone, rubber, dried putty and calcified deposits. Use a plastic putty knife so you don't scratch the sink. 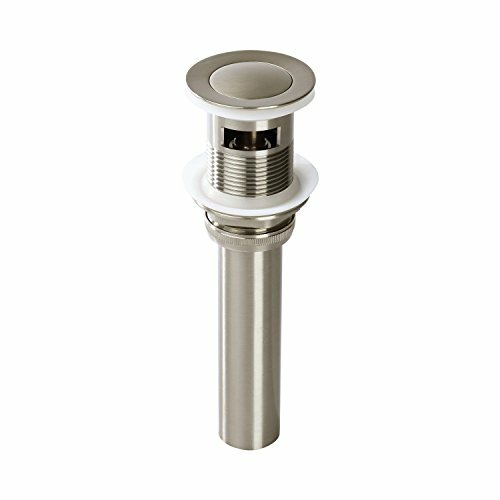 ✔ Solid brass construction with brushed nickel finish on the surface of drain assembly. ✔ Hole Fitting: 1-5/8" (Minimum Diameter Requirement). ✔ Fits standard sized US plumbing. ✔ Including matching brushed nickel mounting ring and all rubber gaskets for installation. ✔ Designed to Work w/ Sinks w/ Overflow, superior Corrosion & Rust-Resistant Finish. If you have any questions about this product by Fryotuc, contact us by completing and submitting the form below. If you are looking for a specif part number, please include it with your message.